Kaduna State Governor, Nasir El-Rufai on Thursday assured corps members deployed to Kaduna State by National Youth Service Corps (NYSC) of their security as operatives have been put on alert to safeguard their lives and property anywhere they are serving in the state. This was even as the governor warned ministries, Department and Agencies of the state government not to reject any corps members posted to them at the end of the 21-day orientation course currently ongoing at permanent camp, km 16, Kaduna-Abuja express way. Declaring the 2016 batch ‘B’ (Stream II) orientation course shortly after the swearing-in of 2,160 corps members deployed to the state by Justice Mairo Muhammed, El-Rufai said, his government is committed to security of both new and existing corps members servng in the state. 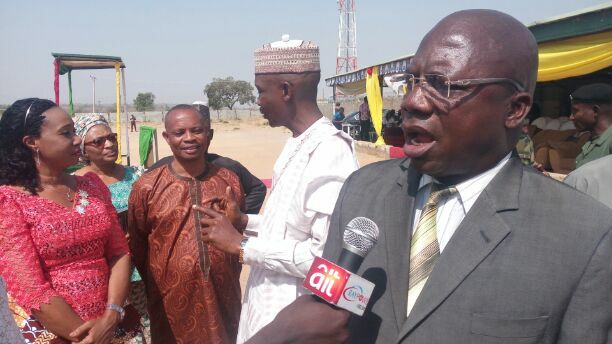 Represented by his Commissioner for Sport and Youth Development, Daniel Dan-Auta, the governor said, ”the state government will continue to provide the enabling environment for you to discharge your duties and serve the nation delligently here in Kaduna. I want to assure you that security of lives and property of all citizens in our dear state remain the top priority of my administration. “Our security undertaking and measures are holistic. We are more concern about their security and we are watchful at all places they may be posted. Their security, safety and convenience to deliver their service are guaranteed. “The security apparatuses have been put on alert across the state considering the fact that most of them are coming to this environment for the first time which means security eye must be doubled on them”, the governor added. Earlier, the Coordinator of NYSC in the state, Bello Ballama reiterated the commitment of the scheme and willingness to cooperate with the state government in rendering services to the the good people of Kaduna State in whatever capacity it is called up to serve. He however urged corps members to participate in the mandatory Skill Acquisition and Entrepreneurship Development (SAED) programme which he said was specifically designed to empower them and reduce the rate of unemployment and in the country.